Technology in Education is always evolving. Teachers want the best tools available to help them educate their students. As long as classrooms have existed teachers have been using some form of communication tool or visual aid to help them impart their knowledge. Digital Signage can be an effective device in this environment when used correctly. Any kind of tool needs to support a student’s learning, but how can Digital Signage help in education? From blackboards to whiteboards, whiteboards to projectors, from projectors to interactive whiteboards the chain is always moving to better and better technology. This leads us to the latest education tool, the Interactive Touch Screen Display. The screen was designed with the classroom in mind. A stunning HD display shines brightly compared to static old projectors. When using projectors the lighting conditions in classrooms had to be greatly altered to use. With the Interactive Touch Display even in the brightest of rooms with windows and direct sunlight everyone can see. Thanks to their frosted glass front, they diffuse the light instead of reflecting it making it infinitely more clear and legible. They can also offer and much better and stable image quality and no annoying shadows either that users got with projectors. Smartphones and tablets have revolutionised the way that everyone interacts with screens. You can be confident that students any age will have some experience using Touch Screens. Numerous educational apps and flash games are available to help in the classroom. Teachers should not underestimate the value of getting students actively involved in the learning process and with up to 10 touch points it allows for groups of students to use the screen and learn together with just their fingers. Even better is the fact an Interactive Touch Display is an all in one solution. An internal PC built into the display allows for the screen to be ready for use at any time. Even without the Internal PC though a teacher can easily connect their laptop or computer via one of the easy access HDMI or USB ports at the front of the display. 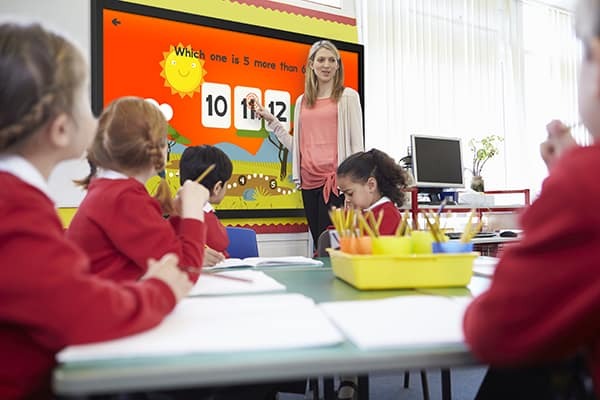 A classroom equipped for the future is not complete without an Interactive Touch Display as the centrepiece. Digital Signage’s reach can extend far beyond the classroom in an education environment. With such a large number of people constantly moving around a school or campus, Digital Signage can be used as a communication tool for students, staff and visitors. Android Advertising Displays, both Wall Mounted and Freestanding, can be used for general announcements, advertising clubs and events or for wayfinding purposes. Switching to Digital Signage allows you to clear the clutter of old noticeboards with glorious and stylish Advertising Displays. With a large and vibrant display your content will be able to make much more of an impact and more likely to deliver its message to its target audience. With so many different rooms and lectures/classes occurring in one location at any time using our POS Displays as a room management screen is possible. 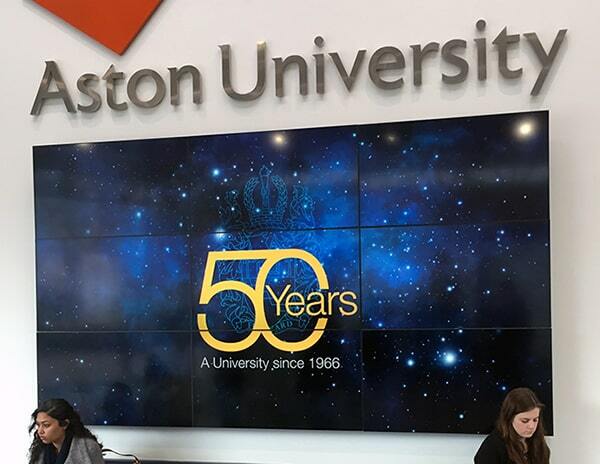 Educational institutions are always looking to make a grand impression to visitors and prospective students that is why LCD Video Wall Displays are becoming more and more common in reception areas at such places. With narrow bezels and the ability to scale to huge sizes Video Walls are always a wow piece of Digital Signage. For school playgrounds and entrances Outdoor Advertising Displays can be used to communicate not only with students but with parents too. Digital Signage can open up new lines of communication with everyone involved in the learning process. Digital Signage is one of the best communication devices around. It can communicate messages and knowledge to a large number of people. This is why the education sector is starting to realise the benefits of what Digital Signage can bring. From the classroom to the hallways, Digital Signage can help communicate knowledge; for any Educational Institute there is nothing better than that.